Flora says . . . ..
Everyone, and I mean EVERYONE, in Atlantic Canada knows what I’m talking about. But sadly for everyone living west of New Brunswick, Frenchys does not exist. You ask 10 people in rural Atlantic Canada where they got the pants or shirt or coat they are wearing and at least 4 will proudly say “I got this at Frenchys”.Frenchys is an addiction. In the summer, busloads of mostly women will do a Frenchys’ run down the French Shore of Nova Scotia, stopping in all the outlets on the way. Why, you ask, do they check out different outlets? The answer is obvious….Because every outlet carries different stock! 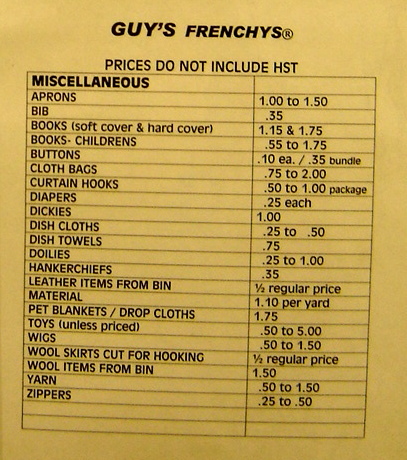 You see, Frenchys sells end-of-the-line clothing, second hand articles and all the accumulated discards that can be found in the New England states. And all of this at standardized pricing.